Las Vegas ReLeaf Dispensary introduces cannabis infused beer. 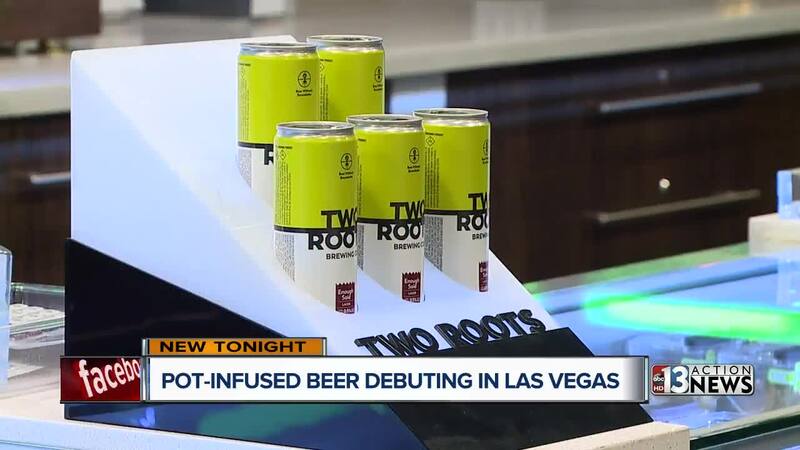 In a state with legalized marijuana, a Las Vegas dispensary is on the cutting edge of products by introducing cannabis-infused beer. Las Vegas ReLeaf Dispensary is the first one in the world to produce a drink like this. "It's really exciting," said Kevin Love with Las Vegas ReLeaf Dispensary. "Especially in Nevada. What better city than to have a product like this premiering right?" The "cannibeer" called Two Roots doesn't small like marijuana and it doesn't taste like marijuana. Love says it will give you the same effects as traditional marijuana. "They are never going to get to a point where they have one and they are completely obliterated because it's micro served." You can get cans with 2.5 grams of THC or 5 grams of THC. The beer comes in five different types: Lager, IPA, Wheat, Stout, and Ale. "It's really going to paradigm shift the entire industry and create products that are more normal for consumption so I can buy this six pack and bring it to a BBQ with my friends and family." Las Vegas ReLeaf Dispensary is holding a launch event Friday from 5 to 7 p.m. where you will get to taste an uninfused version of the beer which means it won't have any cannabis in it but you will get to understand the taste of the beer.